$P_DISPLAY_NAVBARS = Displays the top and bottom navbars. $P_DISPLAY_LOGO = Displays the logo image in the header. $P_COLLAPSIBLE_CATEGORIES = Displays collapsible categories. $P_PROFILE_SWITCHER = Displays the profile location switcher on viewtopic. 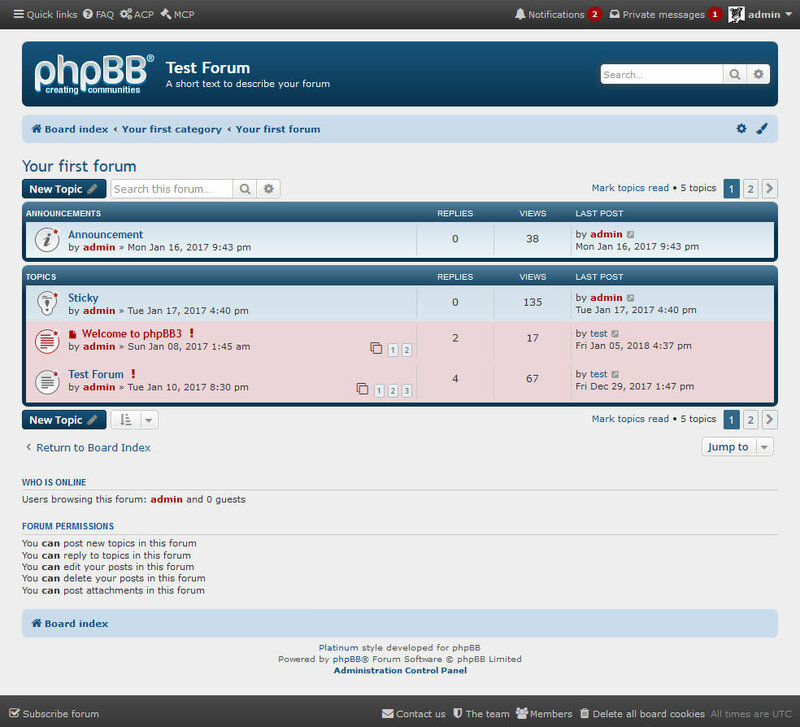 $P_VIEWFORUM_OPTIONS = Displays the sticky hide switch on viewforum. $P_SQUEEZED = Squeezes the top and bottom navbar content to have the same width as the body. $P_HEADERBAR_FIXED = Makes the top navbar fixed to top of page when scrolling. $P_NIGHTMODE = Enables the night mode switch. $P_COLOR_SWITCHER = Displays the color switcher. Last edited by jrolson on Sat Mar 09, 2019 6:30 am, edited 19 times in total. Yay! Thank you, thank you, thank you. Testing on a local install now. *other platinum colors now share CSS and images for faster editing. 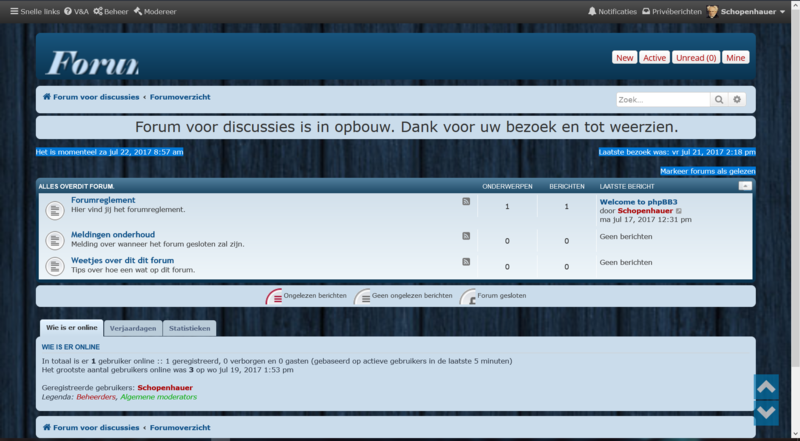 Hello JRolson - I returned for my new forum to your fantastic Platinum style. But I encounter some problems. I used a background - so I have to make some links readable. Also I still have not figured how to show my logo. display: inline-block; and made everything fitting. *added built-in color switcher & post profile mover. Any update on getting this released to the CDB? Doubt it would pass approval, since it contains extra files not found in prosilver. Any chance to update the icons to font awsome in a future release? I think that would be fantastic for this style. Which icons are you referring to? 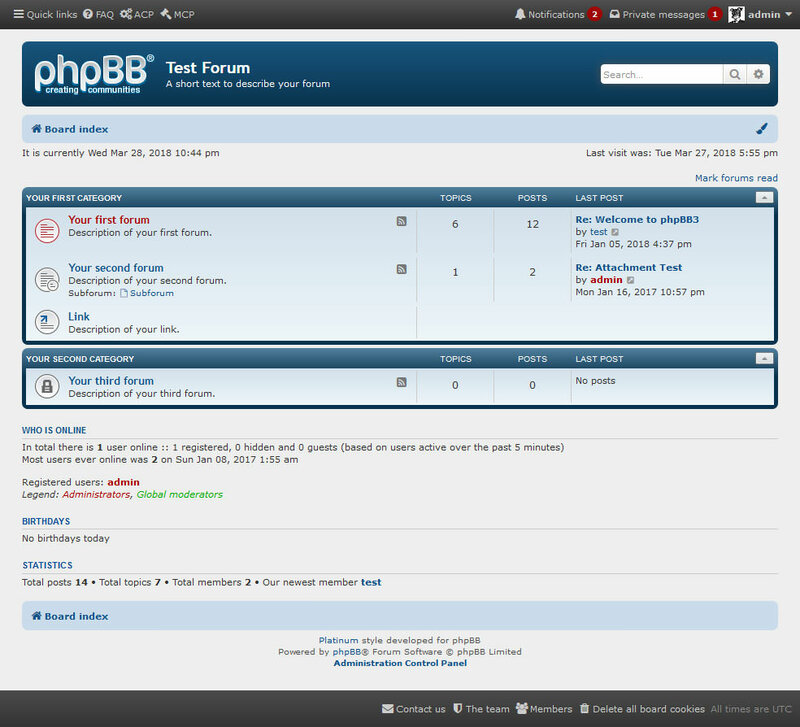 Hello, I mean the icons in front of the forums. I don't see how you make one color "stick" (green in my case) for everyone. I see a post that references a template/config.html file but it doesn't say what values to put. I assume this must be created? Can the control on the navigation bar be hidden? Also navbar.html has issues, like no login/logout links. I removed the whole thing and replaced it with the code in the prosilver version of the template to get it to work. I also applied the green style by looking in the inspector to see how the style was changed, and made changes to colours.css to get the green style everywhere. I think you should compare all your templates with prosilver's templates in case there is other functionality missing. This style wasn't made with the thought of having the admin choose a default color but to allow users to have the freedom of color selection of their choice. But this is something I can look into for adding in the future, but may be tricky with all the variables. Also will look into the navbar issue.